Nicolay Ivanov on the attack for Whitley Bay in their League Cup semi-final against Marske United. 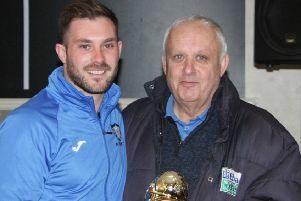 Although disappointed to lose their League Cup semi-final to Marske United, Whitley Bay manager Ian Chandler was happy with the performance of his team. Two goals in the closing stages of the contest helped the defending Northern League champions run out 3-1 winners. Chandler said: “Nobody let the team down, there were no mistakes and no issues. They tried for 90 minutes, all the 14 players. “On another day, had Adam Shanks got his head on that cross from Nikolay Ivanov it might have been 2-1 to us. That was with around 20 minutes to go and it might have been a different end to the game. “But they brought on first team forwards in Brunskill, Owens and Newby so they’ve got a bit more strength, whereas we had as strong a team as we could on the pitch, and the three substitutes Hylton Laws, Nikolay Ivanov and Glenn Reardon are lads who have come into the team in recent weeks. That extra strength they’d got is what’s told in the end. “We conceded an early goal and they had a few chances early on, straight from the kick-off they went up and scored but it was disallowed. “We seemed to start a little bit flat but we bounced back, we got a couple of half chances to get back in it, one when Alex Kempster got in and went round the keeper. “He was unlucky, on another day it could have been different. But Marske are a strong team and they play with style.